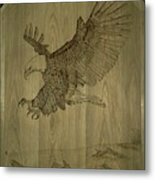 Eagle Door Panel by Angel Abbs-Portice - " x "
Eagle Door Panel metal print by Angel Abbs-Portice. Bring your artwork to life with the stylish lines and added depth of a metal print. Your image gets printed directly onto a sheet of 1/16" thick aluminum. The aluminum sheet is offset from the wall by a 3/4" thick wooden frame which is attached to the back. The high gloss of the aluminum sheet complements the rich colors of any image to produce stunning results. 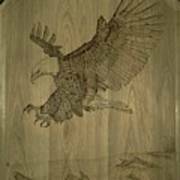 There are no comments for Eagle Door Panel. Click here to post the first comment. I am an Artist of many years. I started out painting and pencil sketching. My art has progressed over the years. I very much enjoy diamond tip etching wildlife on granite and glass. I have completely fallen in love with Pyrography (Wood Burning). I have been commissioned for tables, chairs, cabinets and all sorts of home decor. I enjoy traveling to work on homes and businesses for pieces that I am working on. My work is featured in galleries all over the US and Canada.